We manufacturer Calcium Saccharate in all grades for food and pharmaceutical industry. Typical specifications will meet the pharmaceutical standards. 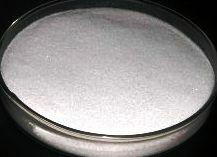 D-Glucaric acid, calcium salt (1:1) tetrahydrate. Calcium D-glucarate (1:1), tetrahydrate [5793-89-5]. Calcium Saccharate is the calcium salt of D-saccharic acid. It contains not less than 98.5 percent and not more than 102.0 percent of C6H8CaO8·4H2O. A: Dissolve about 0.2 g in 10 mL of water by the addition of 2 mL of hydrochloric acid: the solution so obtained responds to the tests for Calcium. Specific rotation: between +18.5 and +22.5. Test solution: 60 mg per mL, in 4.8 N hydrochloric acid that has been allowed to stand for 1hour. Chloride— A 0.50-g portion dissolved in 10 mL of water by the addition of 2 mL of nitric acid shows no more chloride than corresponds to 0.50 mL of 0.020 N hydrochloric acid (0.07%). Sulfate— A 0.50-g portion dissolved in 10 mL of water by the addition of 2 mL of hydrochloric acid shows no more sulfate than corresponds to 0.60 mL of 0.020 N sulfuric acid (0.12%). Sucrose and reducing sugars— Dissolve 0.5 g in 10 mL of water by the addition of 2 mL of hydrochloric acid, and boil the solution for about 2 minutes. Cool, add 15 mL of sodium carbonate TS, allow to stand for 5 minutes, and filter. Add 5 mL of the clear filtrate to about 2 mL of alkaline cupric tartrate TS, and boil for 1 minute: no red precipitate is formed immediately. Assay— Dissolve about 600 mg of Calcium Saccharate, accurately weighed, in 150 mL of water with the aid of a sufficient volume of hydrochloric acid. While stirring, preferably with a magnetic stirrer, add about 30 mL of 0.05 M edetate disodium VS from a 50-mL burette. Add 15 mL of 1 N sodium hydroxide and 300 mg of hydroxy naphthol blue, and continue the titration to a blue endpoint. Each mL of 0.05 M edetate disodium is equivalent to 16.01 mg of C6H8CaO8·4H2O.